I haven’t done one of these in a while, but here’s what the random numbers generator spat out this time: Daredevil #178 by Frank Miller with inks by Klaus Janson! This story takes place ten issues into Miller’s run as Daredevil writer, and the first scene features one of his most famous creations, Elektra, getting a very spectacular invitation to work for the Kingpin: he sends a bunch of goons to attack her and then leaves a note that reads: “Elektra, if you are alive to read this, you are as deadly an assassin as I have been told. I should like to discuss with you employment opportunities in my organization. /The Kingpin” Nice! I guess advertising in the newspaper doesn’t quite cut it. Miller leaves Elektra to ponder the job offer while we cut to Matt swashbuckling his way to work in a mood that would stun modern-day readers (which lends at least some credence to my claim that Miller’s DD was not as “dark” as many would suggest). He professes his love for New York while contemplating stopping for a danish on his way to the office. The law partners’ most recent case ties directly to the Kingpin’s dealings. They are representing the Daily Bugle against the charges brought against the paper by a mayoral hopeful who’s had his connections to the Kingpin exposed. An interrupted witness interrogation later (which has Matt make an elegant getaway) and Foggy is worried enough about his partner to decide to hire Danny Rand and Luke Cage to act as his body guards. They make themselves useful right away when Matt is approached by three men on the trail of their start witness. After a full on fight, Matt repays the two guest stars by being anything but grateful. Fortunately for the case, Matt manges to escape his captors – ahem, babysitters – by jumping down an open elevator shaft. He finds out what he needs to know and continues to go about his business when Luke and Danny catch up with him on fifth avenue in the middle of a parade (don’t know which one it’s supposed to be, it’s clearly too warm for Thanksgiving). Matt switches to Daredevil once again, and he and Danny “Iron Fist” Rand launch into an unusually contrived hero versus hero fight, based simply on Danny’s hunch that DD is hiding something. 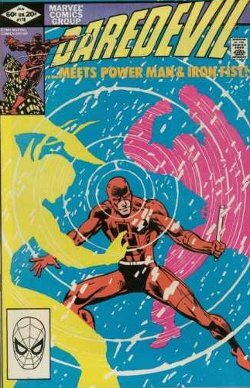 The issue ends with Dardevil solving the case and Elektra stumbling into Fisk’s office, ready for her first assignment.. This issue is plenty of comic book fun, with some of the more traditional comic book clichés that one might not have expected to see. All in all, an enjoyable 3 out of 5 for me and a reminder of happier, though not necessarily uncomplicated, times for Matt. I love this issue. I think it's super cute how Matt and Danny never lay a glove of each other. They just duck each others stuff. It also a good example of how Matt's acrobatic skill are way awesome. When he's tired of the fight he just uses a lamp post to remove himself from it. What's weird is Matt keeps calling him "son." In the modern books their played about the same age. Thoughts? Yeah, this is a fun issue. I thought about Matt calling Danny "son" too. They are supposed to be about the same age even here, but this seems to be one of those nasty habits that DD has kept from his earlier pre-Miller adventures when he throws the word around quite a bit under some writers. Glad to be here. DD also called foes Toothsome a lot back in the day. Alway thought that one was odd also.